Used extensively among transfer printers to prevent bleed back of inks onto their fabric and to help eliminate ink buildup on the felt blanket. Ink bleed back to the fabric produces seconds, while ink build up on the felt shortens its life. A variety of basis weights are available, depending on the severity of ink bleed through that needs to be controlled. Standard weights range between 30 and 40 pounds. Solid plain paper, as well as, perforated papers are readily available. Backing paper is currently stocked in New Jersey, U.S.A. and Mexico City, D.F. Widths: 36" (914mm), 49" (1245mm) and 64" (1625mm). Note: Although these are the standard in stock widths, we are happy to accommodate any request. Please contact us for samples, special requests, and pricing. This is the same material used by the machine manufacturers (OEM's) on their platens. We have supplied it for use on all types of flat or "buck" press type machines, for example, Bates, George Knight & Co., and Practix. Available in three densities, Soft, Medium and Firm, the medium density is most often used. Samples available upon request. For sheet lengths over 36", the maximum thickness is 1/8" (3.175mm). Lengths: 3' (914mm) is the minimum and also the preferred increment. Thus, if 5' (1524mm) is needed, you would need to order 6' (1829mm). We offer this product for a variety of uses, but most often to cover the platens on flat or "buck" press sample and production printers. Various weights are available, but the standard is Style 853, which is a 10 oz. 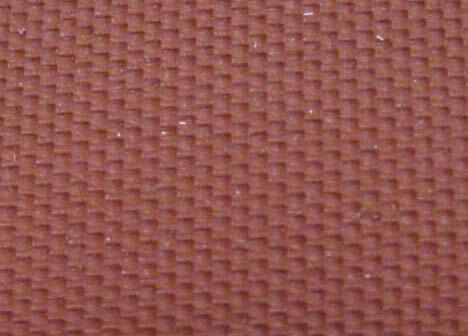 per square yard, 2 x 2 twill. Permeability is 40 - 70 CFM (200 - 336 DM). Other woven and non-woven products are also available for this use. 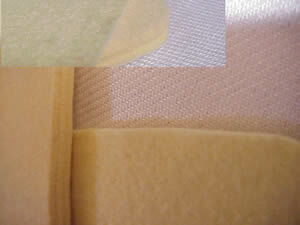 Kevlar® fiber is frequently used. Three of our most popular Kevlar® options our non-woven Styles 4565 (6 oz./yd2) and XT33841 (10 oz./yd2) and a needled Style XT40821 (40.5oz./ yd2). Should you desire yet another type fiber, weight, or construction process, please feel free to call and discuss this with us. Widths: available up to 80" (2032mm).